You are currently browsing the category archive for the ‘Sydney’ category. 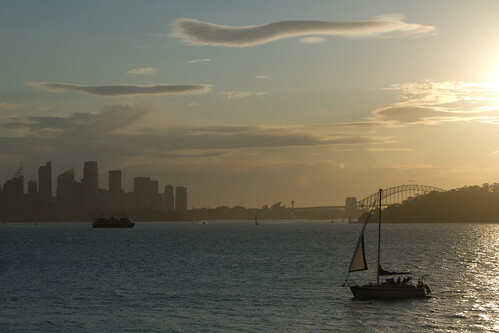 There is one thing Sydney does exceptionally well, and that is to make a spectacle of itself. 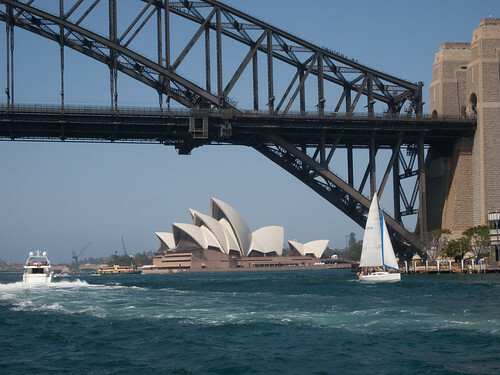 The harbour, the sailboats, the outrageous opera house, the beaches and bodies. Let’s face it, compared to Melbourne, Sydney is a bit of a floozy, dedicated to nothing more than making money and having a glorious time. Melbourne is like the maiden aunt, forever looking over her spectacles at the her naughty niece. Going tut, tut…. I may have everything absolutely wrong, of course. I am a foreigner, after all. 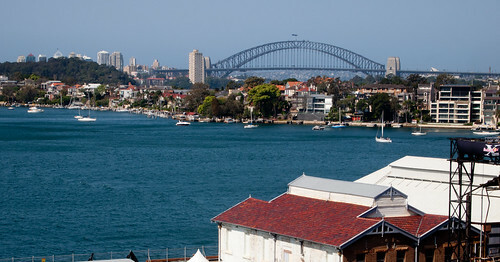 Sydney did start out as the only officially sanctioned British settlement in Australia. The settlers of Melbourne sailed across from Tasmania and put up their tents without any authorization. They were illegal upstarts, a second wave of boat people. The discovery of gold changed everything. Gold has a way of doing that, turning pirates into princes overnight. When you shoot up to Sydney for a quick visit and the weather gods offer you a blast of warm sunshine, rather than cold, wet weather like it did last time, it is hard not to get the impression that Sydney is the bride that was meant to be, and we ended up with the best friend, the daughter that was destined to make doilies rather than marry into society. My excuse was the usual one. I was tagging along as the trailing spouse at yet another conference. A friend from Sydney had invited us to stay with her, and it was too good to resist. I took the opportunity to catch up with another friend from the long distant past. Barvara hails from Sydney, but she spent many years living in many other places, including London, France and New York City. 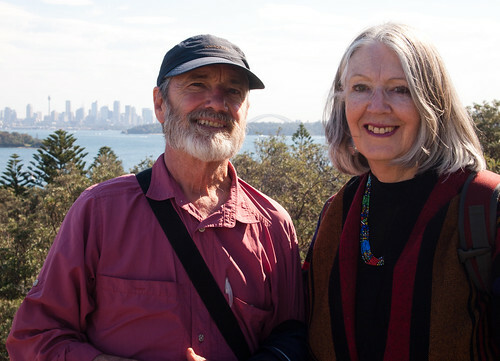 We met in 1969, first in Salonika, Greece, then again a week later in Istanbul. I had hitchhiked there from Denmark and she had arrived from London by way of the Greek islands. We ended up spending some time together down along the southern coast, not far from Antalya, in the village of Side. Barvara re-discovered my whereabouts on Facebook shortly after we arrived in Australia, but we had not seen each other for forty-three years when this trip took us back to Sydney. I wondered how we would recognize one another, but she had inherited a talent for it, nailing an old primary school classmate on the street not long ago and even coming up with a name. There wasn’t enough time, of course. Too much had happened to both of us. We remembered some images from Turkey. We filled in a few of the vast gaps, toasted the good times and commiserated over unhappy events. It was all we had time for. I leafed through her book of photographs and she listened to my history of inherited children. We shared a long bus ride back from Watson’s Bay. There was a quick goodbye. I managed to make it back in time for a dinner party. Friends of our host had been invited. There was champagne and sparkling conversation. I drank it all in and went to bed, exhausted. The following day, my wife and I kicked back and relaxed with Claire and and her rambunctious sheepdog, Bridey. 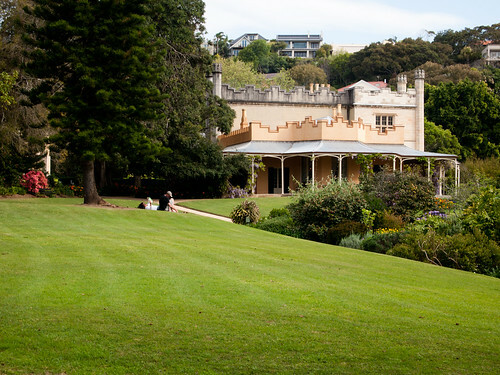 We went for a long walk in Centennial Park, then visited Vaucluse, the odd estate that began life as the abode of an Irish knight, then took on new status, if not real respectability as the home of William Charles Wentworth, the father of the Australian constitution. Wentworth was born in the Colony, His father had been arrested for robbery four times and his mother had been a convict as well. D’Arcy, the father, prospered, but the “convict stain” was passed on to his son. It was exacerbated by his illegitimacy. The new settlers had brought along their class consciousness, of course, and they were either “emancipists” (former convicts) or “exclusives” (free settlers and military men.) William was educated in England and returned to Sydney in 1810. At the age of 21, he and two friends discovered the first route across the Blue Mountains. Three years later he returned to England to study law. He was a strong advocate for establishing a constitution in the Colony and introducing trial by jury. Upon his return, he became one of the wealthiest men in New South Wales. He hosted large dinner parties to celebrate the departure of each succeeding governor and became a leader of the emancipist faction. In 1824 he founded The Australian newspaper and used it to attack the Governor and other exclusives. He struck a deal with seven Maori chiefs to buy a third of New Zealand for a pittance, which would have made him the largest landholder in the world if Governor Gipps had not vetoed the transaction. As Wentworth aged and became wealthier, his populism shifted to conservatism. He lived in England for the last years of his life, but his body was returned to Vaucluse for burial. On the way back we took a long walk along the water at Neilson Park. It was tricky footing, but the sunset was beautiful. Sydney showing off again, revealing her true colours. Claire’s house in Edgecliff offers such a wonderful view of the harbour that it is hard to see how she tears herself away long enough to do the grocery shopping or dog walking. It was a Sunday, though, and the weather was gorgeous. So we walked down to the beach and caught the ferry into Circular Quay. It was chaotic, the Sydney marathon was in progress. We managed to thread our way through the crowd and catch the connecting ferry to Cockatoo Island. Once covered with trees, Cockatoo is now home to some fifty cranes. The largest island in Sydney harbour has been through many incarnations in its life, serving as a prison for convicts from Norfolk Island, a workshop to repair ships, an industrial school for girls and a reformatory. In the 1880s and 1890s, shipbuilding and ship repair expanded, and Australia built its first steel warship on the island. The dockyard finally closed in 1992, and in 2001 the Sydney Harbour Federation Trust assumed control. 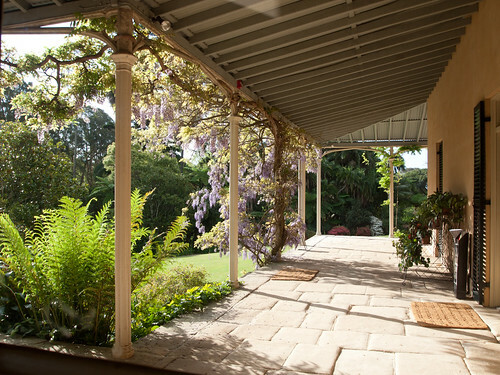 It is now open to the public for overnight stays, as well as various events, like the bi-annual Sydney art shows. A gelato and a bus ride carried us back to Edgecliff. Just time to catch our breath for the flight back to Melbourne. Straighten up, tighten our seat belts. Act civilized. Melbourne doesn’t put on airs or act like an actress. She wears sensible shoes and whispers in church. We don’t want to disappoint the old girl. When my wife mentioned an upcoming conference in Sydney and asked if I would like to come along, I didn’t need much persuasion. It has been on my list of must-see cities for quite some time. I jumped on the internet and booked two cheap tickets, realizing my mistake a minute too late, when it popped out of my printer. My error was in not realizing that there are two airports in Melbourne. Tullamarine International Airport is about ten minutes away in light traffic, twenty at rush hour. The other airport is located some 62 kilometers southwest of here, right outside the city of Geelong, a metropolis of some 205,000. When I called two minutes later to report my mistake and ask for assistance, I was informed that the discount airline owned by Qantas could not fly from Tullamarine because they would be competing with the mother company. I could write off the tickets I had just purchased, or fly out of Avalon, where parking was cheap. So, we got up early. Halfway across the bridge the reminder in my brain went off, the senility signal that lets me know I have done something really dumb. We were heading for a city with one of the most spectacular settings in the world and I had just forgotten my camera. To my mind, I was going practically naked. Traffic was light, so we arrived early, only to discover that the departure had been delayed a half hour. I had been notified by email but hadn’t realized it. The comedy of errors was just beginning. The conference was being held in a lovely hotel at Coogee Beach, right on the ocean. The morning paper predicted rain– all three days. Rain like I had never seen in Melbourne. Monsoon rain. Sydney had the good sense to provide its airport with rail transport, so we took the train into the City. We braved the downpour a few blocks to a friend’s flat. She had a fine view of the harbor, and planned to offer us lunch on the patio, followed by a good beach walk. After lunch we went for a drive instead. 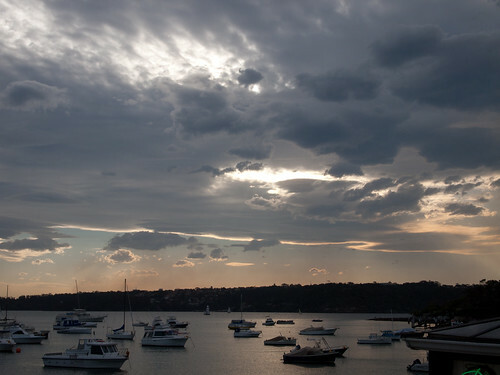 The next morning it was only spitting out so I set off on a constitutional from Coogee to Bondi Beach. There were no bronzed bodies to distract me. Wind was whipping up waves across the beautiful rocky shore. Halfway there I came across a cemetery where the dead have the most amazing view. To a surfer, wet is wet. The famous Bondi beach was deserted except for human seals. I caught a bus into the city and it was there the deluge broke. The word rain is inadequate. It was coming down in buckets. I ducked into an upscale noodle place and settled in for a long lunch. Everyone out on the street was moving very quickly, battling the fierce wind and rain with inadequate umbrellas. Smokers huddled in doorways. The Museum of Sydney was right across the street, a port in a storm. It was a good place to begin my visit. Inside, I came across a wonderfully apt quote by the accomplished Australian author, Geoffrey Dutton. The next day the rain let up. I was finally able to explore without gumboots. I circumnavigated the famous opera house, walked under the towering bridge, toured the laneways of the Rocks. When asked, I graciously offered to snap fellow tourists in front of the obligatory backdrops. Feeling naked. But then I began to accept the fact. It is hard to really see when you are busy snapping. And I would have been taking the same pictures as everyone else. They are all on Flickr. Check it out. Sydney. It’s one spectacular place.